Android Operating System by default doesn't have the screen recorder of it's own in distributed installation. In order to enable the screen recording you have to use external apps or the API enabled ROMs. Many apps allow you to make use of recording API to let you capture the screen. In this review, we take a look at some of the screen recording apps for Android. Earlier versions of Android didn't had many options when it comes screen recording. However the recent versions of operating system updates now allow you to record the screen and different camera modes. Here are some of the apps that you can use to record the Android screen. 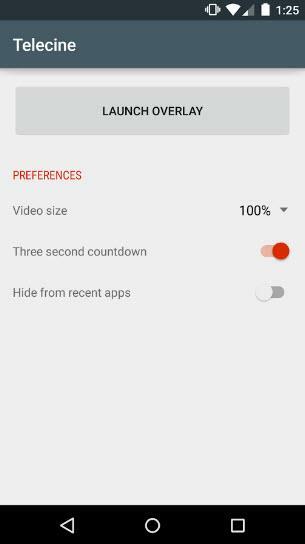 This is one of the simple screen recorder to use. The app doesn't have any complicated settings to go through before using it. And you can just start to record the screen quickly with a button. It also records audio and gestures on your phone. The app does not add any watermark or ads into the recorded video. Also there is no time limit for the video output. All of these features are for completely free of cost. There are no in-app purchases or upgrade version forced on you. This makes the app very much preferable compared to the other apps in the Android store. 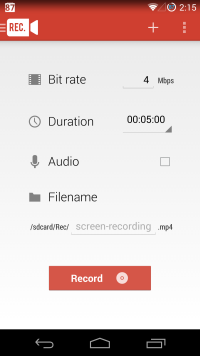 The company that makes this app also released a desktop recorder, which you can try. It is one of the popular app on the Google Play Store. The app includes an ability to put on overlay that let's you know that the recording is being performed. It has no limitations for how long you wish to record the video. Like most of the free apps on the market, it doesn't add any watermark into the video output. It outputs the video in MP4 format and the quality of the output is good too. It is free to download from the Google App Store. It doesn't have any in-app purchases or even donation button. It doesn't even get in the way of your notifications. The app is open source and any developer can patch the bugs and contribute to the development. OSSR is one of the premium app with better video output. It has both free and premium versions. The free version is also limited in functionality and requires you to buy premium version for better output. It adds the watermark into the video output and the same can be used for adding your own logo. In terms of learning curve it doesn't require you to spend much time learning the process. It just makes use of four simple steps to record the video on screen. The app though is paid for the advanced features and also most of it's free features are not suitable for low budget users. However the quality of the video output is much better with this app. So with premium upgrade you can use the app for better quality recording output. The app has many features and editing options compared to the other apps in the market. The app makes use of a button that captures the screen without showing its own instance. You can capture front camera and the working screen at the same time. It can also record the gestures on the device screen. You can also trim the content in the recorded video. The app doesn't require you to root the device. The app is free of cost to download from Google Play Store. Further any extra functionalities can be purchased from the in-app purchase options. The app is premium and costs 4.99$ in the Google Play Store. Note that app requires root access for some of it's advanced features. It'll only work on the rooted devices, so make sure you have rooted the device before using it. You can record front facing camera and audio at the same time as well. The screen recording feature also records gestures and you get to animate those tap actions. The premium version has better video output and advanced feature that you don't find under free version of the app. Expect more better features once app starts supporting HD recording in upcoming version of it's release. This app is limited to the Android version Lollipop and above released OS. It is capable of letting you decide the resolution and orientation of the screen. The app can be used to record the gestures and front facing camera. It doesn't have any time limitations in the app. In order to start the recording you have to hit the top icon. And when you decide to stop the recording then you have to bring the notification section down. This is very simple way to start and stop the recording. It can be used to capture simple recording videos for instant viewing and bug recording. The feature limitation makes it harder to use the app for advanced recording scenarios. One of the oldest app for Android device. The app has both free and premium version released on Google Play Store. However the app didn't remained popular due to other apps offering better video quality and longer video capture time. The rec is very simple to use unlike most other premium apps. All it requires is tapping into the icon and adjusting the bit-rate. Your app will be started and you can record from here onward. You may find that the free app is going to record the session only for 5 minutes. In order to record more than this time, you may have to upgrade to the premium version. Few other apps such as CyanogenMod Screencast App allow you to record the video on any Android device. Some of the apps require you to root the device. So if you are into serious video recording hobby with your Android phone then it is better to root the device. There are many other methods to record the Android screen session. Some of such methods require you to use external hardware. And if you are Android developer then you can use the ADB and other testing features for screen capture. Some of the developers also use the capture card and external premium software to record the Android screen for testing. If you wish to use the video recording session for casual usage or for YouTube then above listed apps can be useful.